Are climate pilots building towards the right climate architecture? 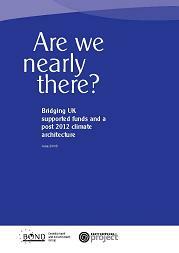 Current climate pilot projects, many of which are housed under the World Bank, are not leading us towards an equitable and effective post 2012 climate architecture envisioned by NGOs in the UK and beyond. There are two major problems which interacted together to cause the crisis: the failure of the financial regulatory and supervisory systems and the failure of the international monetary system. These problems are outlined in written evidence submitted to trhe UK Treasury Committee. DFID snuggling up to the Bank? In February the UK Department for International Development (DFID) belatedly released its latest annual report on its relationship with the World Bank. This continues a tradition which sees these reports appear at irregular intervals. 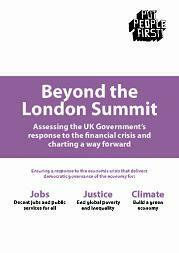 As with previous annual reports there is a marked absence of the critiques heard from the Banks Independent Evaluation Group, the Parliament's International Development Committee or civil society for the period reviewed.